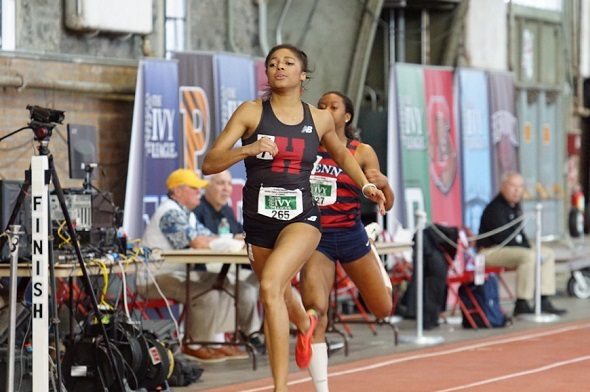 Harvard’s Gabrielle Thomas demonstrated as early as her first indoor track race that she will be a force to reckon with, not only in the Ivy League, but also the national scene. She dominated the sprinting scene on the conference level, winning five individual events and was a member of two winning relays across the Indoor and Outdoor Heps championships. Most of performances were among the best ever in conference history. She was 0.07 seconds away from qualifying for the NCAA Indoor Championships in the 200m this past indoor season. At the NCAA Outdoor Championships, she finished her freshman year with three All-American honors – two Honorable Mention honors as a part of Harvard’s 4×100 and 4×400 relays, and one First-Team honor by finishing third in the 200m (22.47 – top true freshman in the field). And with it also being an Olympic year, Thomas made it to the 200m Olympic Trials finals. She was sixth in the final 22.72, besting professionals and previous Olympians and finishing only steps behind the 2016 NCAA champion Ariana Washington (5th – 22.65) and 2012 Olympic 200m gold medalist Allyson Felix (4th – 22.54). And that is just within one athletic year. She’s only 18 years old. She has three years left in the NCAA system. She can still lower her bests even more. She could become the second woman to win four individual titles in a conference championships (Cornell’s Jeomi Maduka was the first in 2009). She can become the Ivy League’s first ever champion in an event shorter than 800m in either the indoor or outdoor seasons (and we mean in the open events – Brenda Taylor won the 400 hurdles title in 2001 for Harvard). It will be fun to follow her these next few seasons as I believe we have only begun to see her athletic potential. Leena Morris (Cornell) – Morris was the only other rookie woman to win a Heps title in her rookie year. The Big Red thrower won the weight throw at the Indoor Heps Championships with a distance of 63-10 1/4. She also scored points in the indoor shot put with her third place finish (45-11 1/4), helping Cornell finish second in the team standings at the meet. At Outdoor Heps, she finished as the runner up in the shot put (44-08 1/4) to Olympian Nikki Okwelogu of Harvard. This entry was posted on Friday, December 30th, 2016 at 8:00 am. It is filed under Athletes, Awards, Spotlight. You can follow any responses to this entry through the RSS 2.0 feed.